Gabe is dressing up as Tron because he fights for the users (assuming he can get enough props that sufficiently glow by Halloween). Allison is going to duplicate the success of her Young Justice group costume at this year’s New York Comic Con and go as Artemis. Why? She’s an archer who doesn’t have any super-human powers. She just trained really hard. Patrick is getting animated as Sadness from Pixar’s Inside Out. 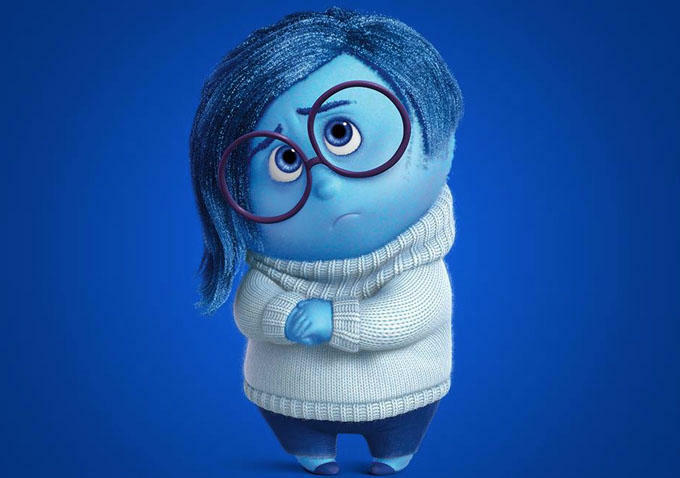 He reports that Phyllis Smith, the voice of Sadness, is his long standing spirit animal. Lauren read all five Game of Thrones books in a few short weeks, so it’s only fitting that she’ll be dressing up as Khaleesi aka Mother of Dragons aka Daenerys Targaryen. Matt’s been using Post-its to plan his upcoming wedding. He’ll be a human-sized Post-it on Halloween in case he needs to jot down any last minute reminders on himself. Hard to believe, but Halloween is just around the corner. Whether you plan to be out trick-or-treating with the kids in the neighborhood, dressing up yourself, or hunkering down at home to hand out candy, there are a bunch of ways you can make your smart home part of the night! Use a door sensor to up the spook factor: If you have a sensor installed on your front door, try this party trick. Set up a Robot in Wink that triggers all the smart bulbs in the front of your house to turn on when the front door is opened (adjust them to orange for maximum effect). Then, make sure the lights are all off when a trick-or-treater approaches, slowly open the door when they knock, and voila! See who's at the front door before you answer: If you’re on candy duty, a smart doorbell like Ring can help you distinguish between trick or treaters and the inevitable ding dong ditchers. They feature a camera so you can see who’s at the door right from your phone...and decide if you want to get off of the couch. Keep an eye out for pesky tee-peers: Let’s face it, they exist, and we may or may not have all done it at one point in time. If you have a smart camera, simply move it to a front window facing the yard. From there, you can quickly see what’s happening from your phone wherever you are. If you have creative ways that you’re integrating your smart home into Halloween, we want to hear about it! Let us know in the comments.